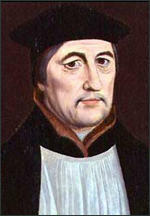 Stephen Gardiner was born in Bury St Edmunds in about 1495. He was educated in Paris where he met Desiderius Erasmus. On his return to England in 1511 he studied at Cambridge University. After graduating in 1518 he taught at Trinity Hall. His pupils included Thomas Wriothesley and William Paget. In October 1528, Cardinal Lorenzo Campeggio arrived in England to discuss the issue with Cardinal Wolsey. Both men tried without success to persuade Catherine to acknowledge the invalidity of her marriage. In January 1529 Henry sent Gardiner to Rome with a "warning that unless a speedy and favourable decision was given by the two legates he would renounce his allegiance to the papal see." When these negotiations were unsuccessful, Wolsey was blamed and all his palaces and colleges were confiscated. (3) Gardiner was not blamed for this failure and in July 1529 was appointed as the King's principal secretary. Gardiner no longer enjoyed the full confidence of Henry and by April 1534 he had been formally replaced as royal secretary by Thomas Cromwell. Gardiner sought his way back into the king's favour by writing in defence of the royal supremacy and of the execution of John Fisher in June 1535, the Bishop of Rochester, who had refused to accept the king as Supreme Head of the Church of England and for upholding the Catholic Church's doctrine of papal primacy. (9) This brought Gardiner back in favour and later that year he became Henry's ambassador to France. Stephen Gardiner upset Henry again during the Pilgrimage of Grace crisis. In Yorkshire, in 1536, a lawyer named Robert Aske formed an army to defend the monasteries. The rebel army was joined by priests carrying crosses and banners. Leading nobles in the area also began to give their support to the rebellion. The rebels marched to York and demanded that the monasteries should be reopened. This march, which contained over 30,000 people, became known as the Pilgrimage of Grace. As Alison Weir has pointed out: "Henry himself had never approved of Lutheranism. In spite of all he had done to reform the church of England, he was still Catholic in his ways and determined for the present to keep England that way. Protestant heresies would not be tolerated, and he would make that very clear to his subjects." (17) In May 1546 Henry gave permission for twenty-three people suspected of heresy to be arrested. This included Anne Askew. Gardiner selected Askew because he believed she was associated with Henry's six wife, Catherine Parr, who he discovered had ignored this legislation "by holding study among her ladies for the scriptures and listening to sermons of an evangelical nature". Gardiner instructed Sir Anthony Kingston, the Constable of the Tower of London, to torture Askew in an attempt to force her to name Parr and other leading Protestants as heretics. 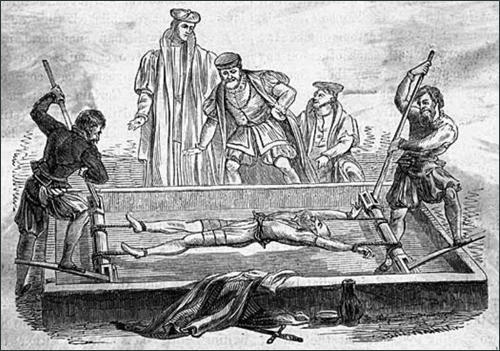 Kingston complained about having to torture a woman (it was in fact illegal to torture a woman at the time) and the Lord Chancellor Thomas Wriothesley and his assistant, Richard Rich took over operating the rack. Heretic being tortured on the rack in the Tower of London. Henry VIII died on 28th January, 1547. In his will signed on 30th December 1546, Gardiner's name omitted from the list of executors and councillors. Edward was only nine years old and was too young to rule. In his will, Henry had nominated a Council of Regency, made up of 16 nobles and churchman to assist him in governing his new realm. His uncle, Edward Seymour, Duke of Somerset, emerged as the leading figure in the government and was given the title Lord Protector. He was now arguably the most influential person in the land. (30) Somerset was a radical Protestant and Gardiner was now out of power. Gardiner's long imprisonment came to an end with Mary Tudor entered London on 3rd August 1553. Two weeks later Mary appointed Gardiner as her Lord Chancellor. (35) About the same time he was restored to the see of Winchester. Over the next two years Gardiner attempted to restore Catholicism in England. In the first Parliament held after Mary gained power most of the religious legislation of Edward's reign was repealed. However, he disagreed with those who advised Queen Mary to marry Philip of Spain. Gardiner thought Mary should marry Edward Courtenay, who he thought was more acceptable to the English people. In early 1555 Gardiner took part in the trials and examinations of John Hooper, Rowland Taylor, John Rogers, and Robert Ferrar, all of whom were burnt. 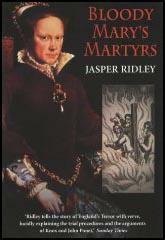 He was also present in the summer of 1555 at meetings of the privy council which approved the execution of heretics. David Loades claims that "the threat of fire would send all these rats scurrying for cover, and when his bluff was called, he was taken aback." (41) During this period around 280 people were burnt at the stake. This compare to only 81 heretics executed during the reign of Henry VIII (1509-1547). 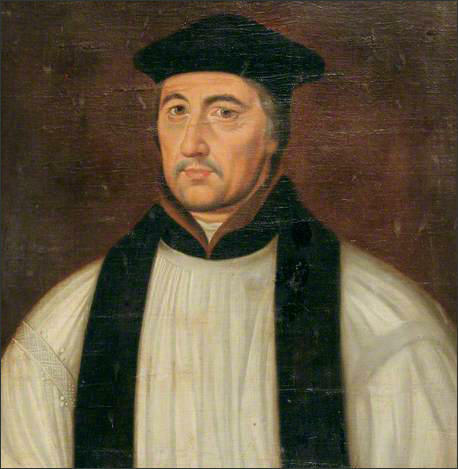 Stephen Gardiner died on 12th November, 1555. The third session of the Reformation Parliament opened in January 1532 and the Commons immediately reverted to the question of clerical abuses. The outcome of their debates was a list of grievances, which Cromwell may have helped draw up, called the Supplication against the Ordinaries (i.e. the judges in ecclesiastical courts; usually the bishops or their deputies). This called in question the right of the Church to make laws of its own, and Henry therefore passed it to Convocation to consider. The bishops were in no mood to welcome such a document, for they were at last engaged in putting their house in order. New canons were being drafted, dealing with non-residency, simony and other abuses, and the Church leaders clearly envisaged a sweeping programme of reform, carried out under their aegis, which would be abruptly halted if their legislative power was called in question. Warham had already made his attitude plain by formally dissociating himself from any parliamentary statutes that derogated from the authority of the Pope or the liberties of the Church, and it was with his encouragement that Stephen Gardiner drew up a reply to the Supplication affirming that the Church's right to make its own laws was "grounded upon the Scripture of God and determination of Holy Church, which must also be a rule and square to try the justice of all laws, as well spiritual as temporal". Gardiner was known to be in the King's favour and had only recently been made Bishop of Winchester. He would hardly have committed himself to such an uncompromising defence of the Church's position unless he had assumed that Henry would approve of it. After all, Henry had protected the Church against the anger of the Commons at the time of the Hunne and Standish affairs, and there was no reason to assume that he would act differently on this occasion. However, Gardiner and his fellow bishops had miscalculated, for by putting so much emphasis upon their independence and autonomy they appeared to be calling in question the King's "imperial" authority, to which he was now so deeply attached. The spring of 1540 saw the surrender of the abbeys of Canterbury, Christchurch, Rochester and Waltham. With this closure, the dissolution of the monasteries was complete. Henry was now wearing on his thumb the great ruby that had, since the twelfth century, adorned the shrine of Becket at Canterbury. On his orders, the saint's body had been exhumed and thrown on a dung heap, because Becket had been a traitor to his King. Not all the monastic wealth found its way into the royal coffers in the Tower. Vast tracts of abbey land were bestowed upon noblemen loyal to the crown: Woburn Abbey was given to Sir John Russell, Wilton Abbey to Lord Herbert, and so on. Many stately homes surviving today are built on the sites of monastic establishments, sometimes with stones from the abbeys themselves. This redistribution of land from church to lay ownership served the purpose of binding the aristocracy by even greater ties of loyalty and gratitude to the King: they were hardly likely to oppose radical religious reforms when they had benefited so lavishly as a result of them. Throughout his reign Henry had periodically displayed a compulsive need to demonstrate that he was in charge, and his brinkmanship over Cranmer's arrest may have been another example of that unlovable trait. If so, then the conservative position may have been less damaged by the debacle than appeared. In 1545 a Yorkshire gentlewoman named Anne Askew was arrested on suspicion of being a sacramentary. Her views were extreme, and pugnaciously expressed, so she would probably have ended at the stake in any case but her status gave her a particular value to the orthodox. This was greatly enhanced in the following year by the arrest of Dr Edward Crome, who, under interrogation, implicated a number of other people, both at court and in the City of London. Anne had been part of the same network, and she was now tortured for the purpose of establishing her links with the circle about the Queen, particularly Lady Denny and the Countess of Hertford. She died without revealing much of consequence, beyond the fact that she was personally known to a number of Catherine's companions, who had expressed sympathy for her plight. The Queen meanwhile continued to discuss theology, piety and the right use the bible, both with her friends and also with her husband. This was a practice, which she had established in the early days of their marriage, and Henry had always allowed her a great deal of latitude, tolerating from her, it was said, opinions which no one else dared to utter. In taking advantage of this indulgence to urge further measures of reform, she presented her enemies with an opening. Irritated by her performance on one occasion, the King complained to Gardiner about the unseemliness of being lectured by his wife. This was a heaven-sent opportunity, and undeterred by his previous failures, the bishop hastened to agree, adding that, if the King would give him permission he would produce such evidence that, "his majesty would easily perceive how perilous a matter it is to cherish a serpent within his own bosom". Henry gave his consent, as he had done to the arrest of Cranmer, articles were produced and a plan was drawn up for Catherine's arrest, the search of her chambers, and the laying of charges against at least three of her privy chamber. The greatest secrecy was observed, and the unsuspecting Queen continued with her evangelical sessions. Henry even signed the articles against her. Then, however, the whole plot was leaked in mysterious circumstances. A copy of the articles, with the King's signature on it, was accidentally dropped by a member of the council, where it was found and brought to Catherine, who promptly collapsed. The King sent one of his physicians, a Dr Wendy, to attend upon her, and Wendy, who seems to have been in the secret, advised her to throw herself upon Henry's mercy. No doubt Anne Boleyn or Catherine Howard would have been grateful for a similar opportunity, but this was a different story. Seeking out her husband, the Queen humbly submitted herself, "... to your majesty's wisdom,, as my only anchor". She had never pretended to instruct, but only to learn, and had spoken to him of Godly things in order to ease and cheer his mind. Henry, so that story goes, was completely disarmed, and a perfect reconciliation was affected, so that when Sir Thomas Wriothesley arrived at Whitehall the following day with an armed guard, he found all his suspects walking with the King in the garden, and was sent on his way with a fearsome ear-bending. Had the conservatives walked into another well-baited trap? As related by Foxe, the whole story has an air of melodramatic unreality about it, but it bears a striking resemblance to the two stories of Cranmer, which come from a different source. Whether Henry was playing games with his councillors in order to humiliate them, or with his wife in order to reassure himself of her submissiveness, or whether he was genuinely wavering between two courses of action, we shall probably never know. In outline the story is probably correct, and we may never be able to disentangle Foxe's embellishments. The consequences, in any case, were real enough. Gardiner finally lost the King's favour, and did not recover it, so that he was deliberately omitted from the regency council which Henry shortly after set up for his son's anticipated minority.